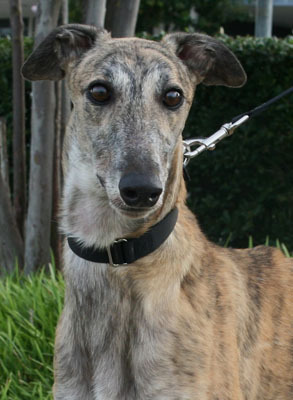 Slippy, aka Git N Slippery, is a 4-year-old brindle male born March 29, 2009. His sire is Dodgem By Design and his dam is Time to Twist. Slippy has 75 races on record at Greyhound-data.com. 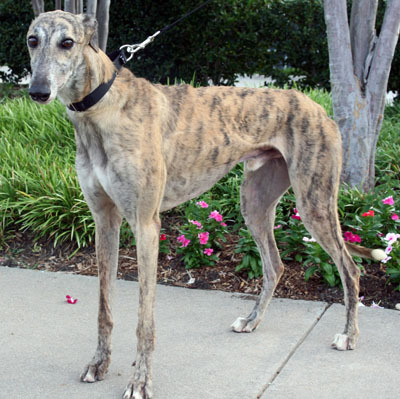 He started at the track at Bluffs Run, Iowa on January 8, 2011 and in 2012 moved to Gulf Greyhound Park in Texas where he raced until May 18, 2013. Slippy is waiting for a foster home. Slippy should not live with cats.